(October 5, 2010 - Toronto, ON - For Immediate Release) - Today LEAF (Local Enhancement & Appreciation of Forests) led members of the local community in transforming a part of the High Park TTC subway station property into an urban forest demonstration garden. 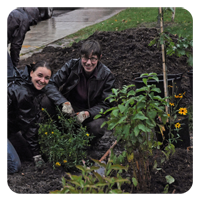 Planted and maintained by graduates of LEAF’s Volunteer Tree Tender Training Program, urban forest demonstration gardens showcase the beauty of native species and help build Toronto’s urban forest. They also provide an opportunity for local residents to play an active role in improving their communities. The High Park garden will complement existing gardens at Bathurst, St. Clair, and Old Mill stations as part of an ongoing partnership between LEAF and the TTC. As similar sites are planted throughout the city, LEAF is helping citizens beautify their neighbourhoods and create refuges for wildlife in urban spaces. LEAF’s Volunteer Tree Tender Training Program and TTC urban forest demonstration gardens are made possible by the generous support of the Toronto Transit Commission, Ontario Power Generation, Sobey’s-Earth Day Canada, the Canadian TREE Fund, the Helen McCrae Peacock Foundation and TIDES Canada Initiative.